How does yoga work? Is there a benefit to doing a bunch of postures, breathing, and meditation techniques while being crammed in a room full of Lululemon Athletica? A group of interdisciplinary researchers gathered at Kripalu Yoga center to discuss the potential mechanisms associated with yoga practice in contemporary settings, while also acknowledging the traditional, historical framework of ethically-motivated practices. The manuscript (LINK) specifically poses a novel theoretical model of the potential self-regulatory mechanisms by which yoga facilitates adaptive reactions to physical and mental stress. This systems network model includes the major limbs of yoga, represented as a skillset of four process tools: ethics, meditation, breath regulation, and sustained postures. 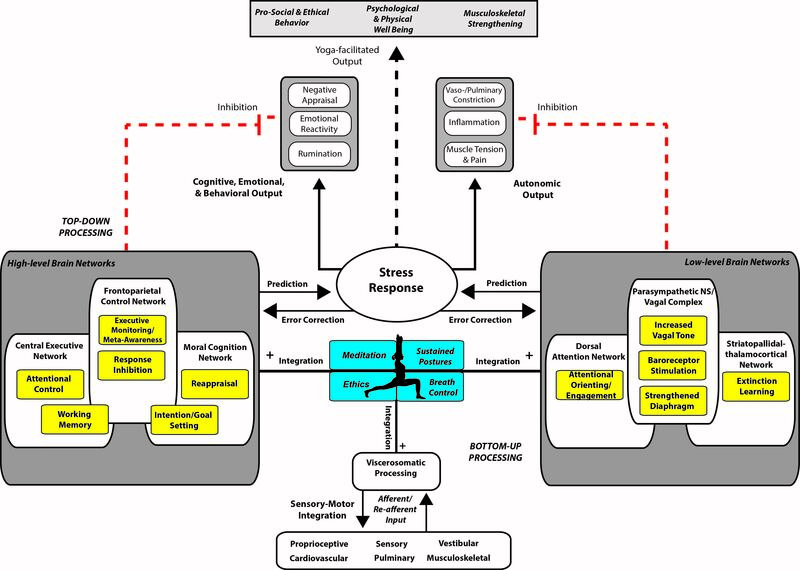 As depicted in the model, cognitive, emotional, behavioral, and autonomic output in response to a stressor is modulated by a number of regulatory processes (yellow boxes) proposed to be influenced by the process tools (limbs of yoga, blue boxes). A stress response is often accompanied by cognitive, emotional, and behavioral output that includes emotional reactivity, negative appraisal, and rumination. In addition, autonomic output such as vasoconstriction, pain and/or tension, and inflammation often accompany maladaptive stress responses; (see solid black arrows). In chronic forms of such stress responses, negative, long-term consequences on health across bodily systems are often the result. Our model proposes that yoga facilitates adaptive output (dotted lines), including long-term psychological and physical well-being, musculoskeletal strengthening, and prosocial behavior, through four primary factors in the context of stress: (1) an emphasis on interoception (body awareness) and bottom-up input (processing of information coming from the external and internal senses), (2) more efficient bidirectional feedback and integration with top-down (cognitive) processes, (3) increased phasic inhibition (red lines) of maladaptive forms of emotional, cognitive, and behavioral output (e.g., reactivity, negative appraisal, rumination) as well as autonomic output (e.g., vaso- and pulmonary constriction, inflammation, and muscle tension/pain), and (4) perceptual inference (using perceptual information from the body) rather than active inference (cognitive processing) for improved prediction (of the world) and Error Correction (less bias from previous mental habits). 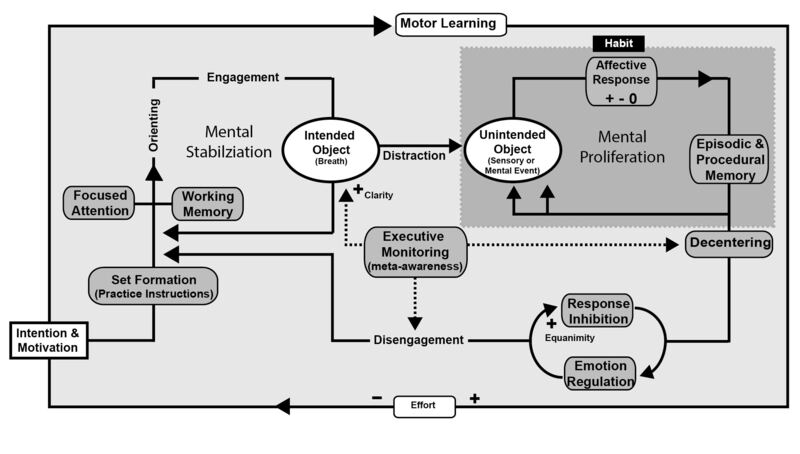 These four factors optimize self-regulation and improve the communication and flexibility by which top-down and bottom-up processes inform behavioral output in the context of physical and emotional stress. Through repeated yoga practice, there is a resulting skillful optimization of autonomic control in response to stressors on and off the yoga mat – keeping arousal at lower levels during stress-mediated challenge, maintaining positive appraisal and reinforcement, helping the practitioner stay relaxed with less effort, and facilitating rapid recovery of bodily systems under stress. 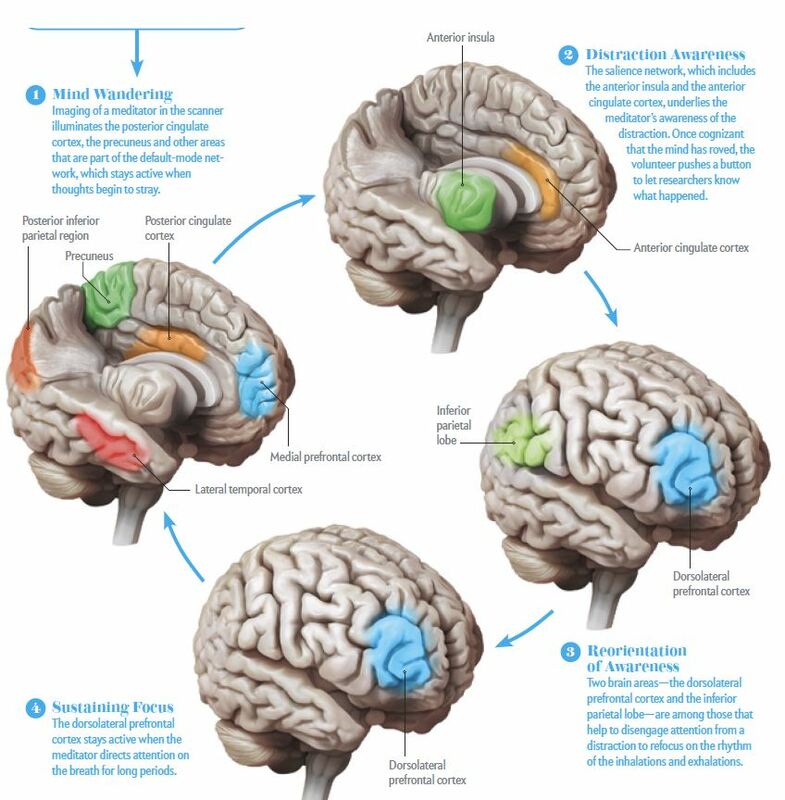 A number of cognitive, emotional, behavioral, and autonomic mechanisms are proposed along with the underlying high- and low-level brain networks that support such mechanisms. The takehome point: Yoga facilitates improved stress response modulation on and off the mat. December 3, 2013 2:41 pm / 9 Comments on Vedana – Affective Feeling Tone or simply Sensation? Our method for understanding mindfulness has been to focus broadly on the goals of mindfulness as it is described in the early Buddhist suttas and in the Western medical model: To decrease mental suffering and create a sustainable healthy mind. In this context, we operationalize mindfulness in two ways: 1) As a broadly defined method for developing self-awareness, self-regulation and self-transcendence (S-ART); 2) As a continuous discriminative attentional capacity. Our second formulation is one critical skill in a multidimentional skillset that is developed and strengthened through specific meditation practices. Other skills are described to function along with mindfulness to support S-ART. To be clear, this is in no way a new definition that is meant to disparage Jon Kabat-Zinn‘s widely disseminated description: “Paying attention in a particular way, on purpose, in the present moment, non-judgmentally” – but more so an attempt to dismantle the concept into component parts so that we can better study it in the laboratory. 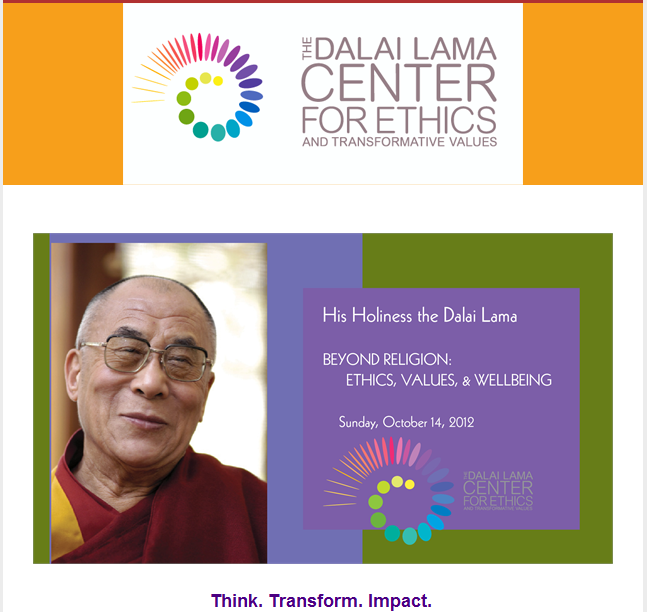 A Talk by His Holiness the Dalai Lama with response by Br. David Steindl-Rast and Fr. Thomas Keating. A unique, precious chance to be in the presence of these three wise elders. This day-long forum is a continuation of The Center’s 2009 inaugural series of conversations with the aim of sparking ideas to address the complex challenges in industry, academia, government, and the world at large through systems thinking and innovation. Global Systems thinking provides practical information from multiple disciplines. A Teaching by His Holiness the Dalai Lama, hosted by Prajnopaya at MIT. Based on Kamalashila’s essential 8th century meditation text, the teaching offers an in-depth introduction to contemplative practice and its contemporary relevance in day-to-day life. The Mind and Life Education Research Group met regularly for 4 years (2007-2011) to create a research agenda for contemplative education. A scholarly white paper manifested as a result drawing on research in neuroscience, cognitive science, developmental psychology, and education, as well as scholarship from contemplative traditions concerning the cultivation of positive development, to highlight a set of mental skills and socioemotional dispositions that are central to the aims of education in the 21st century. These include self-regulatory skills associated with emotion and attention, self-representations, and prosocial dispositions such as empathy and compassion. It should be possible to strengthen these positive qualities and dispositions through systematic contemplative practices, which induce plastic changes in brain function and structure, supporting prosocial behavior and academic success in young people. These putative beneficial consequences call for focused programmatic research to better characterize which forms and frequencies of practice are most effective for which types of children and adolescents. Results from such research may help refine training programs to maximize their effectiveness at different ages and to document the changes in neural function and structure that might be induced. I wanted to share some great videos explaining the benefits of contemplative education and the research being conducted around the world supported by the 1440 Foundation. David Vago on Contemplative Science from 1440 Foundation on Vimeo. Dr. Robert Roeser on Supporting the Support System from 1440 Foundation on Vimeo. Mark Greenberg – 1440 Interview from 1440 Foundation on Vimeo. Amishi Jha – 1440 Interview from 1440 Foundation on Vimeo. Some great press on why contemplative education should be a priority! Imagine munching on oatmeal and scones, sitting on pillows, walking barefoot down quiet stony halls, and doing sun salutations with Buddhist monks, scientists, and other academics, all working towards integrating eastern and western philosophy in a way that may better our relationship with ourselves and with the world. More than a usual conference, more than any old mindfulness retreat, the Mind and Life’s Summer Research Institute melds the two, becoming an incubator for future investigations in contemplative science. Share your research questions, and anyone around you is excited to engage you in a critical discussion that may inspire new paradigms. The MLSRI is truly a beautiful, dynamic force for working towards an end to human suffering. This year’s MLSRI, themed “The Situated and Embodied Mind”, was an enmeshing of scientific and spiritual inquiry aimed at uprooting the western dualist mind-body split and bringing the body back into the inner experience of the self. Major focus was placed on the body’s role in contemplative practices and scientific investigations of these practices. The week’s lecturers included Evan Thomson, Ph.D., Sarah McClintock, Ph.D., Diego Hangartner, Pharm.D., Bhikkhu Analayo, Ph.D., George Chrousos, M.D., Lawrence Barsalou, Ph.D., Susan Bauer-Wu, Ph.D., FAAN, Linda Craighead. Ph.D., Anne Klein, Ph.D., Rebecca Todd, Ph.D., Richard Davidson, Ph.D., Andrew Dreitcer, Ph.D., Michael Spezio, Ph.D., Sona Dimidjian, Ph.D., and Roshi Joan Halifax, Ph.D. Throughout the week, retreaters were exposed to various body-based contemplative practices, including morning yoga led by Mary Taylor and Richard Freeman, and Tai Chi led by Peter Wayne, Ph.D.
Tuesday was a silent retreat day, with periods of alternating sitting and walking meditation. 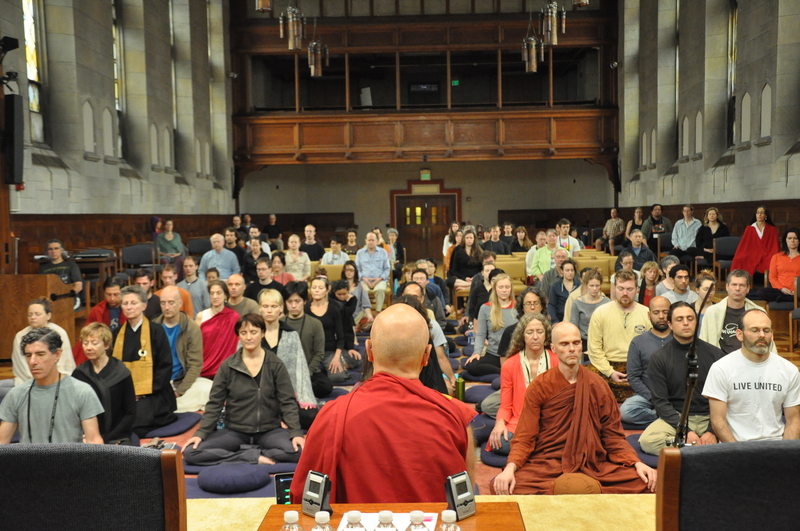 Seated practices were led by Roshi Joan Halifax, Ph.D., Al Kaszniak, Ph.D., and Sharon Salzberg. 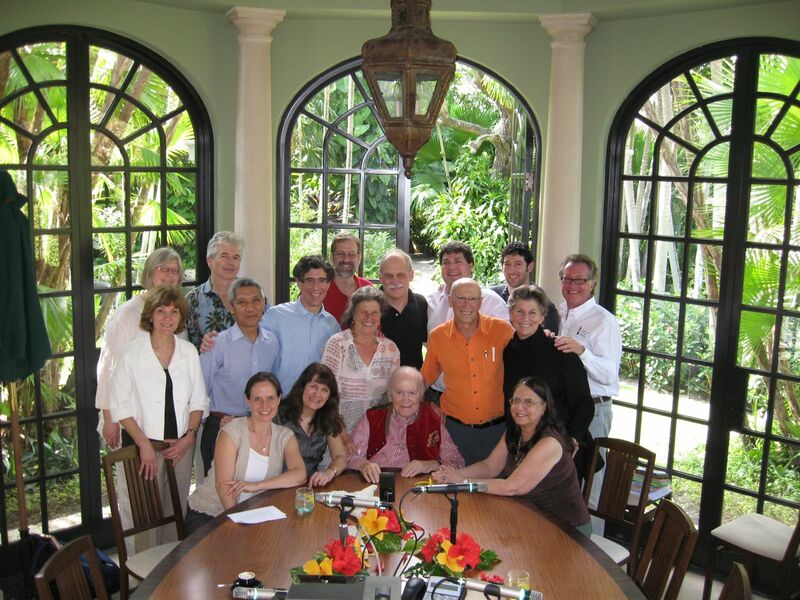 Celebrating Arthur Zajonc’s first year as MLI president, the 2012 retreat promised a bright future for the institute. Stress is immunosuppressive. Research into this pernicious relationship between stress and disease has piqued interest in the ways that contemplative practices might positively influence the immune system. According to a large body of evidence, meditation appears to have profound effects on immune function in health and disease because of its ability to reduce stress. Why does mindfulness reduce stress? Two main facets of mindfulness meditation are equanimity and focused attention. Equanimity towards one’s thoughts decreases reactivity to stressful stimuli, and focused attention helps reduce the tendency towards the type of ruminative thinking that can activate the stress pathway. This relaxation response seems to have multiple effects on the body’s stress pathways. It enhances vagal tone, which in turn suppresses the activity of pro-inflammatory cytokines through the cholinergic anti-inflammatory pathway. It also reduces hypothalamic-pituitary-adrenal (HPA) activity in response to stressful situations, reducing basal levels of cortisol and meditating other downstream stress-related processes. 1) Richard Davidson has conducted studies on the relationship between affective style and brain lateralization, and has found that people with positive affect have increased right prefrontal activation compared to people with negative affect. In a recent study, Davidson and colleagues found that after an eight-week mindfulness program, subjects demonstrated both increased left-PFC activation as well as an increased antibody production after administration of a flu vaccine, indicating an enhanced immune response. 3) Subjects who participated in a three-month mindfulness meditation program demonstrated increased activity in immune cell telomerase, an enzyme responsible for preventing immune cell death. Suppressed telomerase activity is related to increased stress perception. Increased telomerase activity is associated with decreased LDL cholesterol and epinephrine. Another proposed mechanism, in contrast to the stress-reduction paradigm, is a “perception” approach to meditation’s effect on the immune system, whereby one sensory modality shifts to accommodate another sensory modality. This perception approach is demonstrated by the classic “prism experiment”. If you are holding an object in your palm, you are receiving information from both visual and proprioceptive modalities. If a prism is placed in your line of vision, however, there is a perceptual discrepancy between the information from the two modalities. To overcome this discrepancy, one modality will attenuate to match the other. This “cross-modal adaptation” can also explain why mindfulness seems to positively influence the immune system. If one can visualize oneself as “healthy”, they can cause their immune system to attenuate to match the visualized information. However, there are two premises that must be accepted: a) the immune system is a sensory modality, and that b) visualization involves the same neurobiological processes that vision does and thus also functions as a sensory modality. This mechanism lacks substantial empirical support, however, and could benefit from further study. This mechanism may not pertain to mindfulness, which is more about an open, non-intrusive introspection. However, it may support visualization-related practices, such as Tibetan g Tum-mo yoga, in which practitioners are able to regulate their body temperature [LINK]. Benson, H., Beary, J.F., Carol, M.P. (1974). The relaxation response. Psychiatry, 37, 37-46. Davidson, R.J., Kabat-Zinn, J., Schumacher, J., Rosenkranz, M., Muller, D., Santorelli, S.F., Urbanowski, F., Harrington, A., Bonus, K., Sheridan, J.F. (2003). Alterations in brain and immune function produced by mindfulness meditation. Psychosomatic Medicine, 65, 564-570. Jacobs, T.L., Epel, E.S., Lin, J., Blackburn, E.H., Wolkowitz, O.M., Bridwell, D.A., Zanesco, A.P., Aichele, S.R., Sahdra, B.K., MacLean, K.A., King, B.G., Shaver, P.R., Rosenberg, E.L., Ferrer, E., Wallace, B.A., Saron, C.D. (2010) Intensive meditation training, immune cell telomerase activity, and psychological mediators. Psychoneuroendocrinology. Olivo, E.L. (2009). Protection through the lifespan: the psychoneuroimmunological impact of Indo-Tibetan meditative and yoga practices. Annals Of The New York Academy Of Sciences, 1172, 163-71. Pace, T.W.W., Negi, L. T., Adame, D.D., Cole, S.P., Sivilli, T.I., Brown, T.D., Issa, M.J., Raison, C.L. (2008). Effect of compassion meditation on neuroendocrine, innate immune and behavioral responses to psychosocial stress. Psychoneuroendocrinology. Tausk F., Elenkov, I., Moynihan, J. (2008). Psychoneuroimmunology. Dermatologic Therapy. 21(1), 22-31. My name is Emily Epstein, and I’ll be posting on behalf of Dave this summer. I am interning with him at the Functional Neuroimaging Lab. I’m a Neuroscience major at Colorado College, currently working on my undergraduate thesis involving the benefits of body-based contemplative practices for women with sexual abuse-induced pelvic pain. I’m particularly interested in the ways that mindfulness can help those with trauma, and plan to soon journey down the clinical PhD path so I can someday use mindfulness techniques to help trauma victims enhance their body awareness in order to find stability and growth in their lives. For those of you lamenting Dave’s temporary absence, have no fear! He will still be contributing in the creation of each entry, and perhaps periodically posting his own entries. As always, feedback is welcome. Stanford University’s Center for Compassion and Altruism Research and Education present The Science of Compassion. This first large-scale conference of its kind held on the science of compassion brings together an outstanding group of world experts in the fields of altruism, compassion, and service to present their latest research. The conference is open to anyone interested in compassion, altruism and service. Researchers are invited to submit a poster for presentation during poster sessions. Co-sponsoring the event are the Center for Investigating Healthy Minds, The Greater Good Science Center, The Telluride Institute, and the Swedish Institution for Contemplation in Education and Research.